王冰, 黄宝俊, 解大龙, 赵丹懿. 沉默长链非编码RNA浆细胞瘤可变易位1基因提高胃癌细胞对阿霉素的化疗敏感性[J]. 中国医科大学学报, 2018, 47(12): 1081-1084, 1106. WANG Bing, HUANG Baojun, XIE Dalong, ZHAO Danyi. Knockdown of Long Noncoding RNA Plasmacytoma Variant Translocation 1 Enhances Chemosensitivity of Gastric Cancer Cells to Adriamycin[J]. Journal of China Medical University, 2018, 47(12): 1081-1084, 1106. Abstract: Objective To study the effects of the long noncoding RNA plasmacytoma variant translocation 1 (PVT1) on the regulation of chemosensitivity of gastric cancer cells to adriamycin. Methods RNA interference was used to silence the expression of PVT1 in SGC7901/ADR cells. Real-time quantitative PCR was used to detect the effect of silencing. An enhanced CCK8 assay was used to detect the proliferation of PVT1-silenced SGC7901/ADR cells and their sensitivity to the chemotherapeutic drug adriamycin. Cell cycle analysis was performed using propidium iodide (PI) single dye flow cytometry. Apoptosis was detected using Annexin V-fluorescein isothiocyanate/PI double dye flow cytometry. 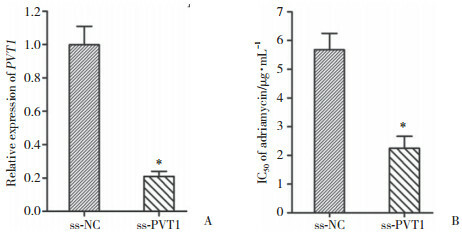 Results Silencing of PVT1 significantly reduced the half-inhibitory concentration of adriamycin in SGC7901/ADR cells. 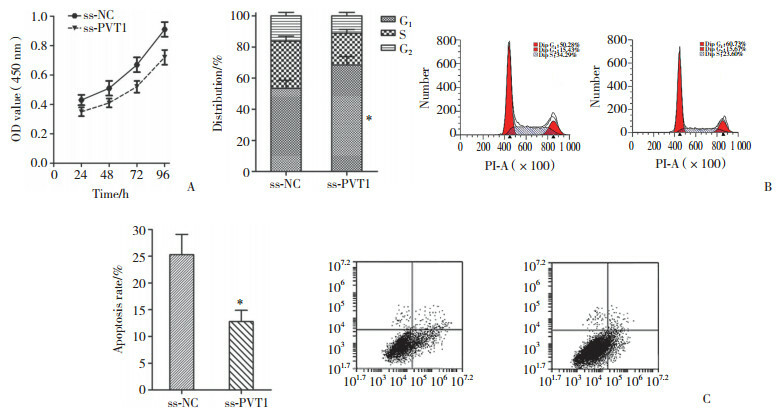 At an adriamycin concentration of 0.5 μg/mL, PVT1 silencing inhibited SGC7901/ADR cell proliferation, blocked cells in the G1 phase, and promoted cell apoptosis. PVT1 silencing also enhanced the sensitivity of SGC7901/ADR cells to adriamycin and adriamycin-induced cytotoxicity. Conclusion Long noncoding RNA PVT1 is associated with chemoresistance in gastric cancer. PVT1 silencing can increase the chemosensitivity of drug-resistant gastric cancer cells to adriamycin. PING G, XIONG W, ZHANG L, et al. Silencing long noncoding RNA PVT1 inhibits tumorigenesis and cisplatin resistance of colorectal cancer[J]. Am J Transl Res, 2018, 10(1): 138-149. LIU E, LIU Z, ZHOU Y, et al. Overexpression of long non-coding RNA PVT1 in ovarian cancer cells promotes cisplatin resistance by regulating apoptotic pathways[J]. Int J Clin Exp Med, 2015, 8(11): 20565-20572.